Do you remember your last protest? I do, because I spent the protest alone with my headphones on clutching a sound recorder. I was trying to avoid both the wind and the eyes of my friends, hoping they wouldn’t come over and say hello. 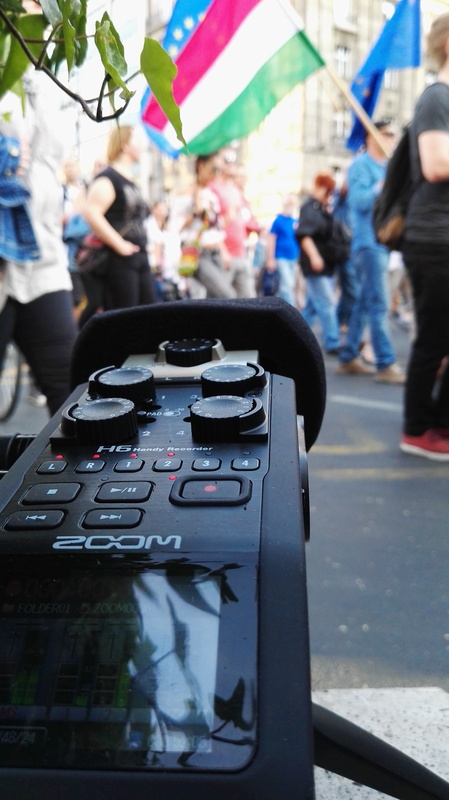 I didn’t do this (only) because I’m anti-social, but also because I didn’t want to spoil the field recording I was making for a recently launched global sound map of protests. The amazing project ‘Protest and Politics‘ is ‘the world’s first global mapping of the sounds of protest and demonstration’. The brainchild of Stuart Fowkes, a UK-based artist, it is part of his larger Cities and Memory website in which field recordings are collected and then remixed, providing both the original capture and a creative imagined alternative. For the protest sound map he collected nearly 200 sounds, submitted by more than 100 contributors. One of them, me, was at the ‘Nem adjuk a jövőnk, itt maradunk!’ (We won’t give up our future, we’re staying here!) protest organised by Nem maradunk csendben (We won’t stay silent) and Oktatási Szabadságot (Freedom for Education). This was a protest at the end of a spring of protests organised in Hungary. The two catalysts were the attack against the Central European University (an independent university that the government introduced a law to try to shut down) and a law that sought to restrict the freedom of civil society. But the roots are much deeper, and include issues such as the squeezing of the free media, widespread corruption, gerrymandering and so on. The protest itself was interesting sonically as the organisers decided to have a sound system at the front of the demo, with DJs playing. The group ‘Nem maradunk csendben (We won’t stay silent)’ had organised a big successful protest party a few weeks before where they alternated between music and speeches. I feel that Hungarian protests are – when compared with other countries – quite quiet. The sound system made it even quieter however, as people didn’t chant or sing much at all, even during the gaps. I’m not sure I agree with Stuart when he says that, “if there’s one sound that defines the last few years and the age that we’re living in, it’s the sound of protest,” as he told WIRED, but it’s a good line for promoting the project and Protest & Politics has been featured in loads of places – you can hear him on the BBC World Service or read a write-up over at Mashable. I think he was onto something however when he told CityLab that, “sound can bring you back to a place or time in an instant in a way that probably only smell can rival.” Listening back to the recordings I made many months ago gave me a memory of an emotion that I didn’t even know I had. Listening to all the different sounds also highlighted the amount of repetition – not only within one protest, but across them, something touched on in an interview for Cracked Magazine. I think part of it is that we’re connected to a global network of protesters and riff off each other, but also part of it relates to what’s engendered by the rhythmic patterns of walking (and, of course, what sounds good as a chant!). Of course there’s as many differences as there are similarities between the pieces and some of the variations between the different recordings – including the quietness of Budapest vs the loudness of the “casserole” protest in Canada – are commented upon in a piece on Atlas Obsucra. You can (and should) listen to all the recordings here!